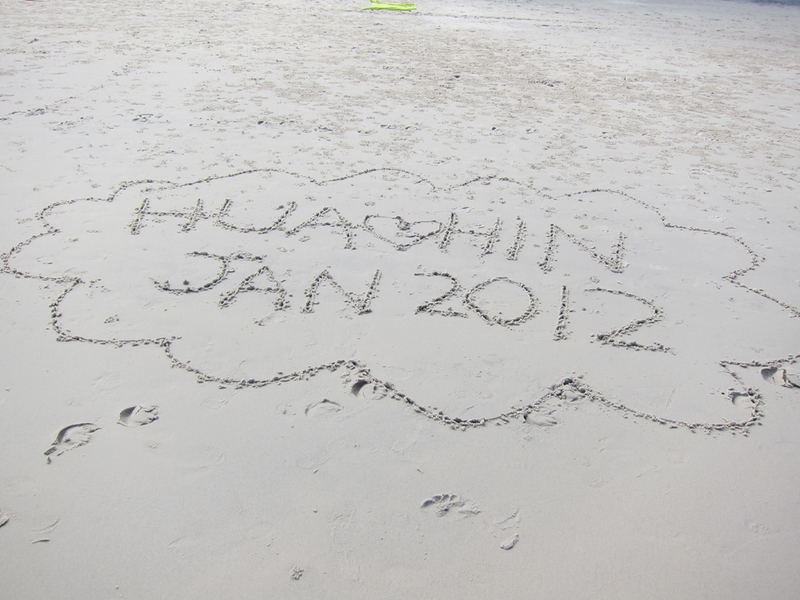 I had my doubts about Huahin. A three hours drive from Bangkok, it sounded more like a pseudo resort town than a real resort destination. It doesn’t even have its own direct flight ! I had further doubts about our resort choice, V Villa, because the website was not as shiny, photoshopped and well designed as some others I have seen, and I read reviews online that said their multi-bedroom villas are not equally made and their Jacuzzi smells funny. But I decided to go there in the end, after taking into account cost – it was significantly cheaper than the alternative (by which I mean I saved enough to buy some very decent masks). In the end, I had a fabulous time. The weekend getaway was by no means perfect, but it was definitely an absolute bargain for value. By bargain, I mostly refer to V Villa. Huahin is pretty much what I expected – not the resort destination I had in mind. The town itself is quite urban, plain and unimpressive (a less crowded version of Bangkok). In my one excursion out of the resort for dinner, the restaurant (a really decent one by local standards) looked like a “dai pai dong” (the Canto phrase referring to street dining in Hong Kong, which barely exists anymore due to hygiene reasons). The seafood, which is supposed to be amazingly fresh due to its proximity to the sea, was not really amazing. The main attraction of the town – the beach, was nothing to be excited about. We have better beaches in Hong Kong. The sand was granular and rough, and it was crawling with small tiny crabs. All the white bumps in the sand, that’s them! The uneven looking parts of sand in the first picture, that’s all them too! They did have the decency to make themselves scarce when we tried to walk on them though (they are so abundant, there is no way to get to the shores without walking through them). But would I lie on that beach and chill with them? Hell no! I’d much rather chill by the pool side of my resort. That brings me back to V Villa, which was everything I imagined a beach resort should be. You pretty much get what you see on the website (our photos here look almost the same as the ones on the resort website!). It had a beautiful infinity pool that overlooked the beach and ocean. Combined with the (mostly) clear blue skies, it was perfect. 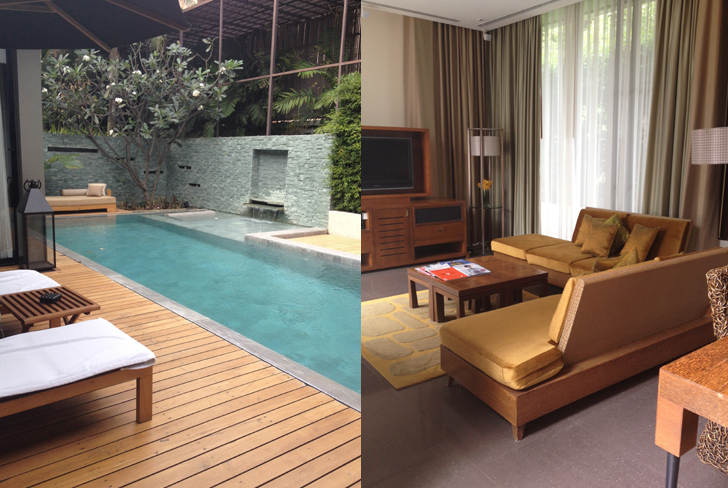 Our villa was spacious, clean and modern, complete with a living room/dining room area and a private pool. They provided us with a iPad and mobile phone to use during our stay. The mobile phone in particular was genius. I think all hotels should offer this service, so guests wouldn’t have to pay exorbitant mobile phone fees to dial locally on the go. How much does a regular 2G phone cost? The “butler service” (the villa version of housekeeping) was very helpful, and managed to meet all our requests. We had a in-villa BBQ that was excellent. There was a private chef cooking for us by our private pool side, a buffet of side dishes laid out for us in our dining room, someone helping us with our plates etc. It was a perfect night in! The spa was also excellent. The price was very reasonable for a resort spa (at around US$50 per hour). There was even a 30% discount promotion! We had a treatment every day. My favourite was the hot compress massage, which felt divine. After our long journey there (the 3 hour drive was painful!) it was just what we needed. The food was also very cheap (though not delicious). The best meal I had there was the pasta buffet. Now those prawns were very fresh! The whole villa is also wifi enabled. But I think the best thing about V Villa is that it is a boutique resort, with less than 20 villas. So they were really able to maintain the relaxing and peaceful resort environment one desires. It may also be because we went during low season (and after a recent flood). Most of the time, we felt that we were alone in the resort! The resort staff organized an elephant riding day trip for us as well, providing free transport there and back (they must have an agreement with the elephant place). It was my first time riding an elephant, and I had a fabulous time. A little dull at first, since the trek we went around for 1 hour is nothing like in the photos. It was more like a manmade trek, sparsely furnished with a few trees and pond. But then they let us ride on the head of the elephant (vs. sitting on the chair tied behind them), and that was a LOT of fun! We even got to feed them afterwards! The elephants are really quite smart . The path was filled with their own feces, and they never ONCE stepped on them. They very strategically went around them. How cool is that? As I said though, the trip was by no means perfect. What you don’t see in the website and the pictures is that the resort itself is admittedly getting a little old. Our pantry for example. We didn’t want to go in there unless it was absolutely necessary. The outdoor cushion seating could use some refurnishing. The daily activities they claim they have (doll painting, kickboxing, yoga) doesn’t actually happen. The second bedroom, in a 2-bedroom villa is indeed built unequally to the master bedroom (much better for a family vs. 2 couples I think). Our bathroom also smelt of bad plumbing. The one thing that dominated my attention for the whole trip though, was the fact that the whole area is infested with mosquitos!!! I wore shorts in my villa’s bathroom for 5 minutes, and immediately got 2 bites! My friend wore shorts and t shirt to dinner one night (where we sat indoors) and got over 30 bites! I am not sure if they have always been there to begin with or if this is a recent phenomena because of the flood, but they were everywhere, just hovering around to bite you if you don’t cover yourself with mosquito repellent at all times (hint: they do NOT respond to Hong Kong bought repellent!). I even got bitten through my black leggings twice! This is by no means the fault of the resort. The whole town is infested with mosquitos. We were in the lobby of the Hilton, thinking we should’ve stayed in a hotel vs. a villa to avoid the mosquitos, when we saw a whole bunch of them just lurking in the shadows! We ended up spending a good portion of our time engaged in anti-mosquito activities. We sprayed mosquito repellent on like perfume. Slathered ourselves with lemongrass oil (apparently they don’t like the smell). Stuck on lemongrass smelling stickers before we slept. Consistently burnt anti-insect incents. Requested that our room be sprayed with insect repellent on a daily basis. Mastered the art of “slipping” through doors, the minimize the chance of them following us indoors. We even downloaded an anti-mosquito app on our iphones, which emits sonic sounds that are supposed to deter them! Did I have a good time? Yes! I especially loved riding on the elephant’s head, hanging by the infinity pool and having daily spa treatments. That fact that it was all very good value for money was a bonus. But would I go again? Probably not. The three hour ride to and back (in addition to the 1.5 hour plane ride), I reiterate, was PAINFUL. The beach was mediocre and let’s not get me started on the mosquitoes again. Next time, I want to go to a real beach resort destination with a direct flight. Does Koh Samui have direct? Maybe the KK Islands in Malaysia? Either way, I can’t wait!